So I finally got out (in the heat) and attempted to find my garden. 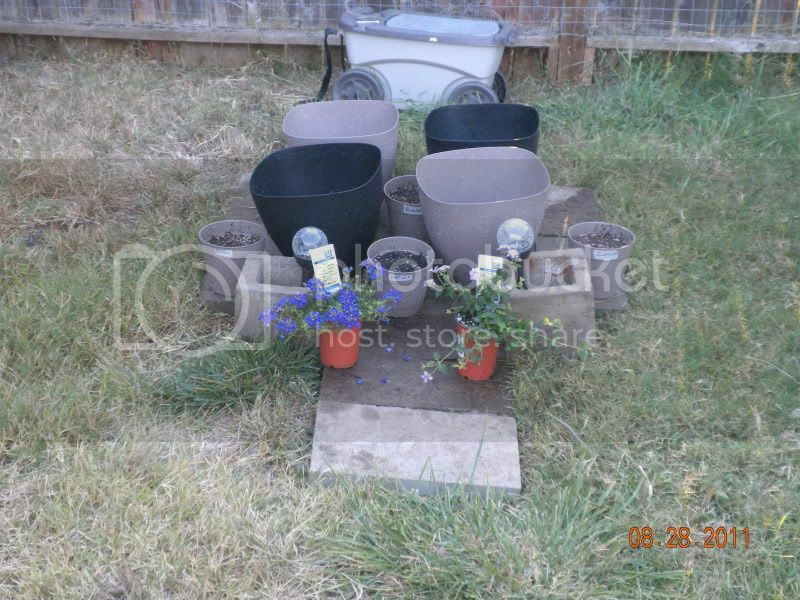 Not to mention I am also starting a nice little container garden that if need be I can bring in this winter. Plan on doing some lettuce and attempting some bell peppers that I found seed for (its a variety mix all different types and colors!) And some herbs that I have been wanting to plant forever that just didnt start right indoors. 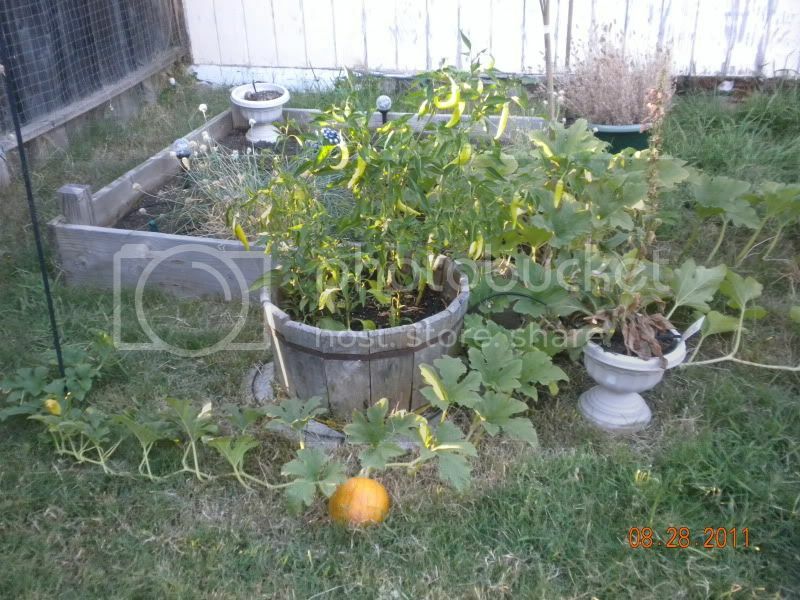 Here are some pics I shot the other day after unearthing the pumpkins and peppers from the weed infestation that took over. And getting the container garden set up (just not completed yet). I wish my peppers would get to it like yours! They look great!!! Did someone say Pumkin Pie? Yummo! The peppers are producing like crazy, and I don't think I have ever seen tidier pumpkin plants! 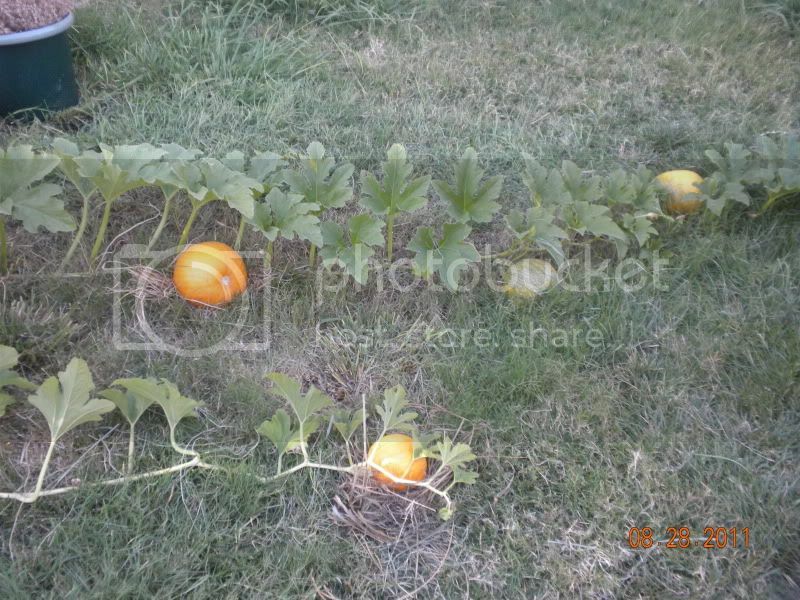 What kind of pumpkins are they? They look about the same size as mine, which are just starting to change color. I thought mine were a bit small, but if yours are also Sugar Pies, then mine should be about right. What a nice reward for braving the heat ! THANKS!!!! Lots of hard work there... but so well worth it! Stella, I cant off the top of my head recall what exactly the pumpkins are, but I believe they were just a traditinal carving pumpkin, could be Sugar Pie but I am not even sure if I still have the seed packet! I will check this evening and see if I cant find something to tell me what they are. But I agree, they are small, much smaller than I had hoped for. But they should still make some killer pumpkin pie!!! As for my peppers... those are my pride and joy. I grew peppers (and well anything for the first time last year) and really enjoyed them. So this year I only grew 2 types (jalapenos and sweet banana) and they are just as happy as can be and SOOO YUMMY!!! 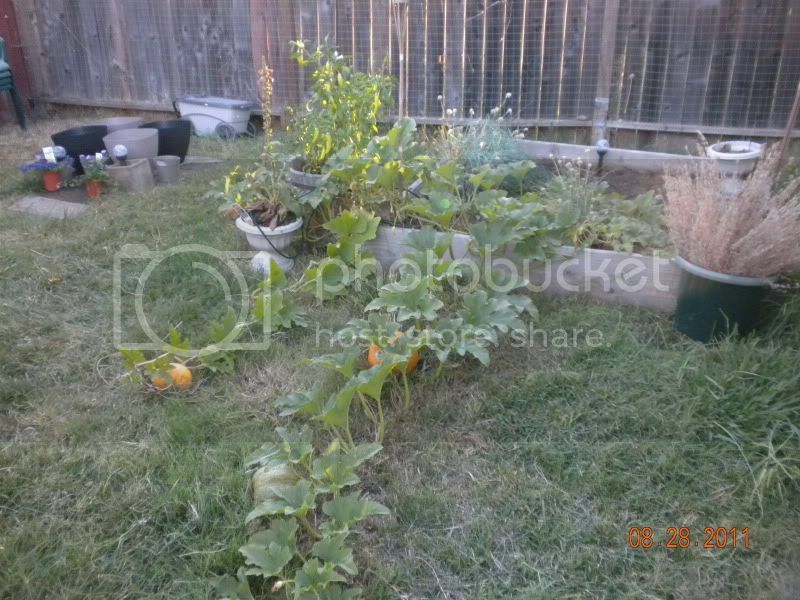 Oh, since this was taken, all the pumpkins are now a nice bright orange and happy as can be. Peppers have been picked a bit, but still a ton on the plants. Great looking plants. I love seeing beautiful pictures of produce this time of the year. Good luck with the container gardening and bringing inside. This year I hope to continue growing some items in my little greenhouse. stella1751 wrote: The peppers are producing like crazy, and I don't think I have ever seen tidier pumpkin plants! What kind of pumpkins are they? They look about the same size as mine, which are just starting to change color. I thought mine were a bit small, but if yours are also Sugar Pies, then mine should be about right. Finally found the seed packet for my pumpkins, they are Triple Treat variety... Whatever that is! Says they are perfect for carving and cooking and they should be bigger, wondering if they are just planted too close or the Potates in the same bed hurt them. Oh well I am sure they will be ok small or not!